Just a personal note: Leonard and I will be attending a “Restoring Honor” rally in Washington DC on August 28th. The mission of the rally is to recognize the First Amendment and to honor the service members who fight to protect these freedoms. This is our small way of remembering the importance of restoring honor in America and paying tribute to our service members. 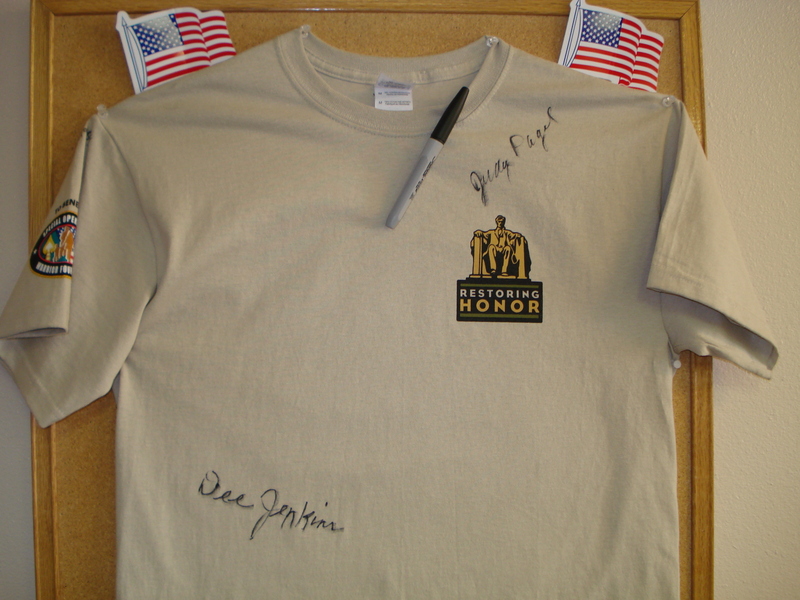 We would be “honored” if you could stop by our office at 1340 Sierra St. here in Kingsburg sometime between now and August 24th to sign a Restoring Honor t-shirt supporting this event. I plan on wearing the shirt to the rally and my goal is to have it covered with signatures from people who believe in maintaining the 1st amendment and who honor our troops, past and present. As a small token of appreciation, you will receive a American flag decal for taking the time to come in and sign the shirt. We will also have the shirt available for signing at our booth at the Summer Band Concert on July 8th. Low Interest Rates Makes NOW A Good Time To Buy! The Fresno Bee on Sunday, June 4th, states that the interest on a 30 year fixed rate mortgage is now at an average of 4.79%, as per the Freddie Mac rate report. It was expected that the Federal Reserve would increase the rates this spring but the European debt crisis is keeping the rates very low. Keep in mind that NOW is also a very good time to re-finance ….. if you still have equity in your home. Our sister company New Era Financial, which celebrates its 20 year anniversary, can help with all your mortgage questions. To talk to a loan officer, just call 897-0968, ask for Leonard or Hal. Also in the Fresno Bee on the same day is an article that states: “It’s cheaper to buy than rent in Fresno”. With the affordability of homes today and the extremely low interest rates, NOW is truly the time to buy. Even though the real estate numbers for May reflect an increase in sales (up 3), the re-sale market here has actually experienced a slow down since the Federal Tax Credit expired April 30th. The Price Per Square Foot (PSF) as noted in the CMA to the right of this column is getting a little bit better each month. Right now Kingsburg is at an average of $128 PSF, which includes big custom homes and foreclosures. However, looking at the numbers closely, the custom homes are coming in at about $135 to $150 PSF. The Northhampton subdivision is doing very well right now with several homes under construction. Anyone thinking about buying a new home should call us first so that we can refer you to the builder. Good news ….. the new Hampton Inn is open for business. Just as an update, the Kingsburg Relay for Life raised approximately $47,000 at it’s first event. Thanks to all of you who contributed time walking, food and especially your donations. It was greatly appreciated. As always, we welcome any comments or suggestions you might have.